Rather than being a simple rendition of what happened when, which is primarily of value to connoisseurs, who know the game well and are interested in seeing how things diverge from the expeced, I intend this to be more of a chronicle for newer players laying out the strategic thinking behind my choices in this game, be they in the end proven right or wrong. I recently picked up AI war, and as I'm the kind of player who tends to play individual games intermittently but intensively when they have my focus, rather than for the long haul, Keith was kind enough to suggest something that would be a bit of a challenge for me after my third attempt at the game on 7/7 with moderate Golems, champions, and the Zenith Trader resulted in a win at >600 AIP within a week of picking up the game. The challenge: A more war focused game conquering planets all over the place and truly driving up the AIP without access to the superweapons that had made life just a bit too easy for me on 7/7. If there's anything cheesier than caps of high damage armour type agnostic armour piercing planetary range sniper units, I'm not sure I want to know what it is. In my last attempt, game #7, I conquered one entire cluster and was at a bit more than 400 AIP when I finally dared to construct a Spire Hub. When a game like AI war tells me that I should expect to need to fortify heavily, I tend to take its word, though perhaps I overdid it a bit. Nevertheless, hardly was construction underway than I was promptly crushed by a wave that included two Armoured Golems, an Artillery Golem, and diverse others that punched through my really heavy duty defenses consisting of all forts, all mines, all heavy beam turrets, a heck of a lot of other turrets, and my fleet. The AI hadn't gotten the memo that this was supposed to be a Spire-only superweapon game, and I had not had anywhere near the time to get the Spire hub, which I located on a planet that the AI had to move through when spawning waves, built up to participate meaningfully in the game. The Golems & Co. punched right past that planet, into the homeworld, and punched it out, behaving just like the Shadow Frigate exo waves I'd fought in my 7/7 win, where the Golems were on my side, in going for the goal rather than getting distracted in other systems. Golems are nasty. That's how I learned that Lightning Warheads, that until then had seemed the cure-all for really tough situations, only tickle Golems. Now I know that Golems – or anything else the game may throw at me equally tough – needs to be either a) met with Armoured Warheads, b) far from home, or c) preferably both. I still like Lightning Warheads, though. They are good at clearing out the rifraff. Win or lose, this is how the result of Keith's challenge plays out, for after this I'll have to turn my mind to other things for a time. I am not sure how appropriate this challenge is for new players in general, as I am a veteran strategy games player and Keith knows it, which undoubtedly informed his setup. Going from a single victory in 7/7 to 9/9 with double AI types in my second week of playing the game can best be described as rough. But it is fun, prevents me from accessing the truly powerful champions, Golems, or Zenith Trader goodies to trivialize defense, and to me, at least, it is a challenge at my current level of game knowledge. What more could one reasonably desire? Try this setup at your own risk. 100 planets with simple clusters. 9/9 Special Forces Captain/Bouncer and Mad Bomber/Reservist. 4/10 Fallen Spire: Sole source of extra superweapons. 6/10 Hybrids for the SFC/B: A bit more aggression from the AI. 0 automatic AIP increase: The hybrids assure me that I should relax and take my time. Complex shiptypes: No opting out of any shiptypes. This map gives me five clusters and plenty of natural chokepoints. It has, it goes without saying, been chosen exactly for those properties. I enumerate the clusters 1 through 5 starting in the lower-left and going clockwise. 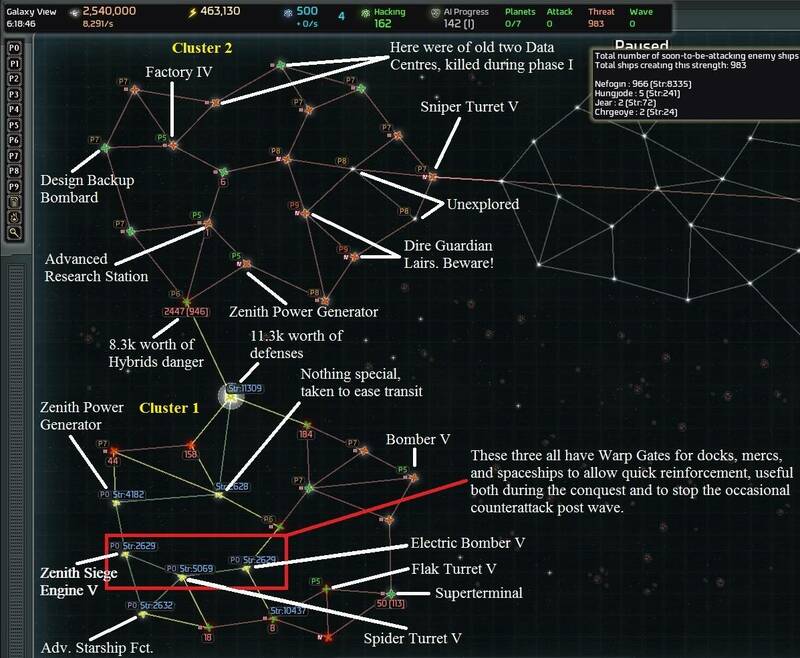 I have chosen my homeworld to be the single chokepoint in cluster 1, which means that for the duration of the early game I'll be tanking the AI directly on my homeworld with all waves incoming from the planet labeled Hub Alpha, which is where I intend in the fullness of time to construct my Spire hub. I did get to see what I could construct in the hub from the ship design menu in game #7 even if I didn't get to actually build a Shard Reactor before death, so it is clear that Hub Alpha will in the fullness of time be a very strong position. Ideally, everything will be stopped there or, if not stopped, then take serious damage passing through the system on the way to the Homeworld. I assume I'll be building more hubs or even greater defenses later on, as Keith told me this was essentially a war campaign. 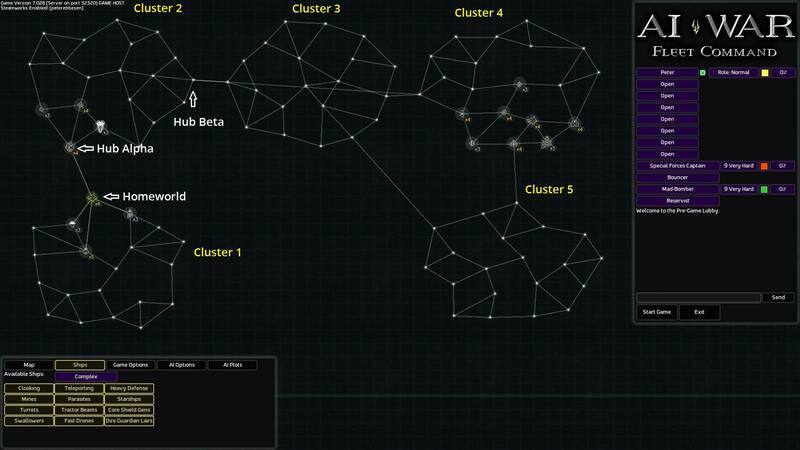 I have thus tentatively labeled the other exit point from cluster 2 Hub Beta. Hub Beta leads directly to both Cluster 3 and Cluster 4. By the time the war really gets going, I'll want enemies to have to fight through both Hub Beta and Hub Alpha to reach my homeworld. I have chosen the Sentinel Frigate because they seemed almost unbelievably cheesy in general and can laugh at the armour of Armoured Golems, and Golems were my bane in game #7. This means that assuming no spectacular fabricator unlocks that radically changes the equation, most planet defenses will be dealt with by simple pummeling from range by the Sentinel Frigates while keeping the rest of the fleet in a single fleetball to kill anybody approaching the Sentinels. The projected phases are as follows based on knowledge gained through games #4 to #7. After these phases, I will have to improvise, which is where it gets really fun and dangerous. 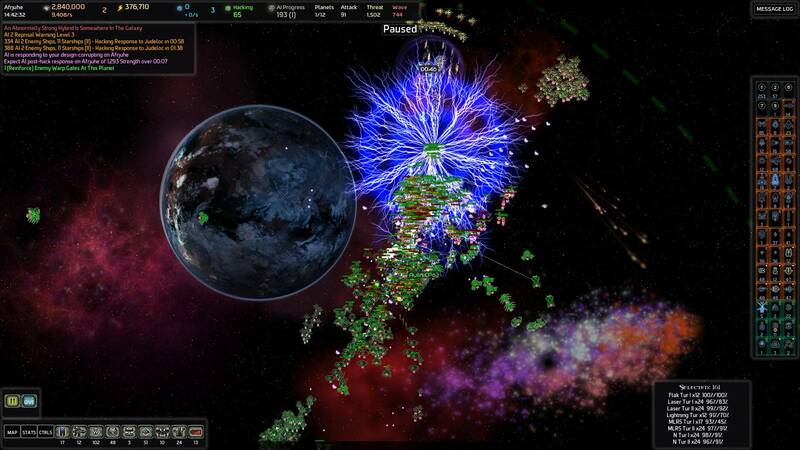 Defensive tech unlocks, start building up a fleet and a strong defense. This is expected to last the first 5 minutes or so. I use a defensive setup strongly based on Kahuna's guide HERE. It is highly recommended for new players to read that thread. 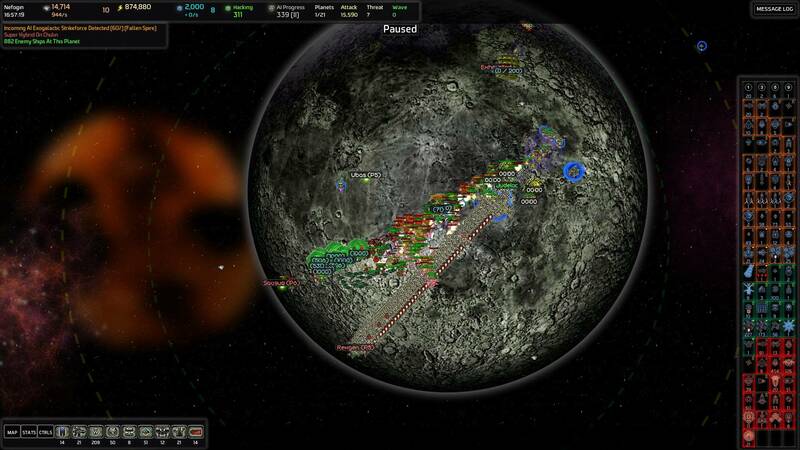 Scout north in cluster 2, sending forces to neutralize a few systems to help the scouts range further out. Mark any Dire Guardian systems and their neighbours for future avoidance. Destroy any Data Centres found. Weed out any hybrids congregating near me on a regular basis. This is expected to take an hour or two, but I must take care not to overdo it as the hybrids progress while I stay at 10 AIP. Repeat step #2 south of the homeworld in cluster 1, with the difference that I start taking over capturable turret controllers, fabricators, and factories once I know that there's no Raid Engine or Dire Guardian Lair next door. Look out for alarms. 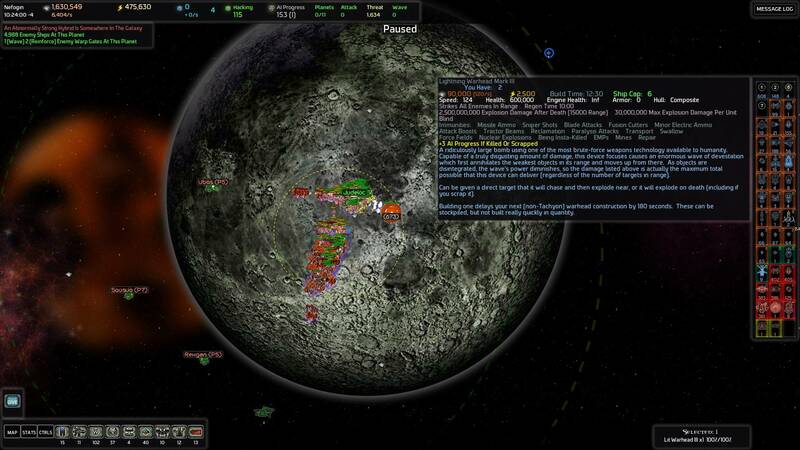 Neuter every planet that does not contain a worthwhile capturable and is not adjacent to one of the AI triggers. During this, unlock more defensive tech to fortify the homeworld chokepoint, the higher tier Sentinel Frigates, level 1 forts, and adjust to fit the developing situation. 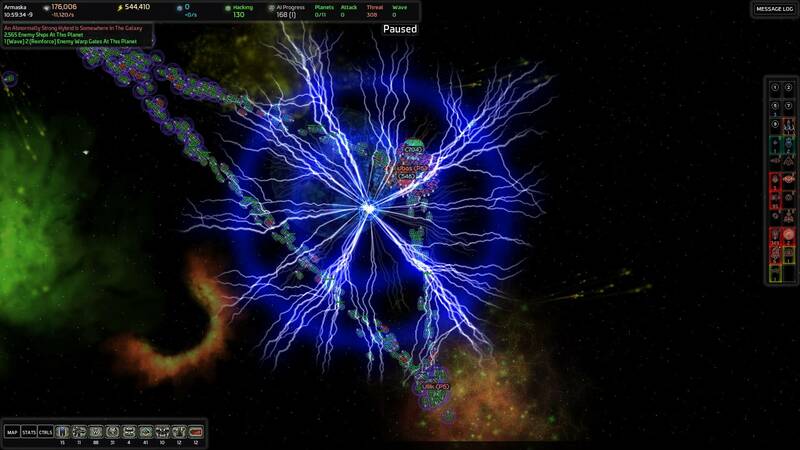 Make sure always to have a stock of Lightning and Armoured Warheads on the homeworld, just in case the AI sends in something truly nasty, the hybrids spawning in clusters 2-5 decide to invade, or I am hit by yet another new game mechanic. There's no "overkill" where existential threats are concerned. This is expected to take a few hours, as I slowly and methodically reduce the southern defenses and take over everything of note there. Systematically take out Raid Engines and Dire Guardian Lairs, and one at a time. Expect massive casualties. Continue unlocking tech. This is expected to take a few hours. Throughout this, recruit the mercenary Neinzul (first priority), missile frigates, and zenith beam ships whenever I'm near the resource cap. Why let income go to waste? Phase 1 ends when everything worthwile in cluster 1 is under my direct control, I have a strong defensive position in my homeworld, and my navy is ready to see the wider world. Begin Shard recovery operations (this may actually start in the previous phase, if I deem I am strong enough, but there's no hurry) up to getting the Refugee Colony established on my home planet, should the shards turn out to be accessible without fighting the hybrids congregating north of my homeworld. Time: Unknown. Unleash the lightning to blast the hybrids gathering on the Hub Alpha planet to enable passage north. I know from game #7 that they'll be there in the hundreds and stronger by far than my navy, but that's the sort of problem that Lightning Warheads were made for. This is expected to take roughly five minues. Go north, and spent HAP on hacking controllers or factories in cluster 2, while also collecting any progressing the Spire campaign up to the Refugee colony step. I'll presumably be under constant pressure from hybrids and special forces during this step, so I have absolutely no idea how long it will take – this is entirely unexplored territory to me. 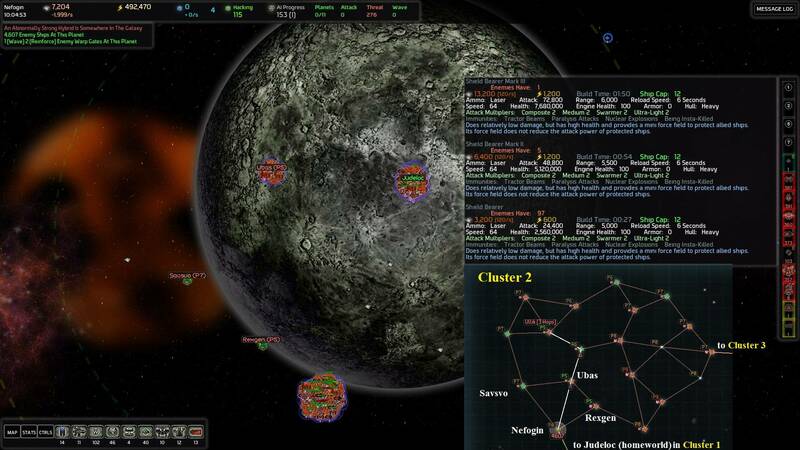 If I feel a need for more tech, conquer a few of the planets in cluster 1 that were left out due to lack of interesting capturables. In game #7 I conquered ALL in my initial cluster to have a safe area and didn't operate at all in cluster #2 before trying to build a Spire Hub. I am not sure whether I'll do it this time, since I'd like to have the Spire Hub up and running before hitting the 400+ AIP range again as the normal waves were getting a bit scary and Keith has assured me that AIP isn't factored into the Fallen Spire exowave strength. Since I now know to meet the Spire Hub exowave with Armoured Warheads, I won't need as strong defenses when it arrives. Regardless, combined with the operations in the previous step I should have a stronger position overall. The time to conquer such extra planets will be negligible as they've already been neutered. Phase 2 ends when I'm prepared to build the Spire Hub. I must definitely have military stations 3 (an early unlock), mark 3 shields, all mines, and level 1 forts unlocked, as well as several turrets depending on my luck with controllers. I will not necessarily have level 2-3 forts unlocked like in game 3, as I am planning on doing it at lower AIP, to make the regular waves less of a nuisance. With metal capped, and with no incoming CPA, shortly after destroying regular incoming waves move the entire navy to one of the three neutered systems adjacent to Hub Alpha in cluster 2, destroy the command station, and take over the system. For the first time since phase 1, I will now have more than one jump gate leading to one of my planets – the jump gates leading to this decoy planet and the jump gate leading from Hub Alpha to Homeworld. I do this to ensure that the AI has a world to target with a jumpgate in the unlikely event that it decides to initiate a wave during the next step. Go to the Hub Alpha system along with a constructor and all engineers. Destroy anybody defending the planet, then destroy the command station, build a Military 3 station, throw spare shields and Core Turrets on it, and begin building the Spire Hub with full engineer support. For the brief duration of the construction of the military station, my only incoming wormhole is to the decoy planet. Without that decoy, it is theoretically possible that the AI would warp in a large wave somewhere at random, which would be really bad when combined with an incoming exo. With resources capped out before construction and with the salvage coming in from the waves destroyed immediately prior to initiating this step, it is possible that I'll complete the Spire Hub and a Shard Reactor while the exowave arrives. And perhaps not. When the exowave arrives, throw Armoured and Lightning Warheads at it until it is dead. Build up defenses in Hub Alpha such that most (all?) things will die here without ever penetrating to the homeworld. It'll only be 12% salvage rather than 50%, but that's a small price to pay for a bit of defensive depth. Phase 3 ends with a shining completed Spire Hub in Hub Alpha, that is so strongly defended that I can laugh at anything except for what the Fallen Spire campaign throws at me. That Golem exowave in game #7 convinced me that the campaign is way nastier than anything the base game throws at me unless I deliberately rack up AIP beyond what I feel I can control. So, how did this plan actually work out? As noted in the beginning, I have progressed far enough in the game that a considerable amount of these opening phases have been accomplished (if not exactly according to my initial planning) and valuable lessons have been learned, and I'll be writing those installments as I find time over the next few days as well as playing on. I'll start by noting that my initial unlocks were Military Stations Mk. II and III, Sentinel Frigates Mk. II, Neinzul Enclave Starship Mk. II, and the Heavy Beam Cannon. Newbie advice: The HBC marks are truly amazing defensive weapons. They are so cheap to construct that you can profitably destroy them whereever they are located in favour of constructing them on the fly in locations that come under attack so long as you have a bunch of engineers present. I generally use most of them at chokepoints – all of them in times of danger – but demolish some or all of them whenever I need to defend somewhere else. This also makes for a good bait. If there's an enemy amassing beyond a chokepoint that will soon be strong enough to attack, why NOT demolish all your HBC's at the chokepoint, thus lessening the threat the AI senses, tempting it to attack earlier... only to quickly rebuild all of them when the AI starts pouring in? Backed up by a few score engineers, you can build all HBCs of all marks in a few second so long as you have the resources, and they provide a considerable boost to your defenses when set up between your command station and your tractor/lightning/flak trap, such that they cover everybody on that final stretch of the assault route or stuck dealing with your TLF trap? Also, one note before the smart guys chime in: As I have progressed further, I later realized that I could just have sent scouts in transports on death trips rather than painstakingly killing off sentries and neutering to push out my sensor net in the early game, but as I hadn't thought of that at the time, well, that's just how it goes. You live and learn. Please do not, kind reader, tell me overmuch about what the campaign will bring. Comment my actions, certainly, but leave me scope for exploration and failure. I am not sure how appropriate this challenge is for new players in general, as I am a veteran strategy games player and Keith knows it, which undoubtedly informed his setup. Definitely. I had to think for a bit on how to set the difficulty to "Serene"
Initial unlocks were Military Stations Mk. II and III, Sentinel Frigates Mk. II, Neinzul Enclave Starship Mk. II, and the Heavy Beam Cannon. As planned, I began scouting cluster 2, which as the reader will recall is the cluster immediately north of my starting cluster, cluster 1, with waves of 10 scouts, pushing them as far as they could reach before they died. Once all that could be reached had been scouted and I had constructed full caps of all my fleet ships and starships, I began neutering planets, leaving only jump gate and command centre alive, in order to allow me to send scouts further. I found two Data Centres, a Factory IV, an Advanced Research Centre, a Design Backup for Bombards, a Sniper Turret V controller, a Zenith Power Generator, and two Dire Guardian Lairs. Now, if there's one thing I fear, and perhaps irrationally so, it is Dire Guardian Lairs. Keith gave me the lowdown on them recently, and they are not quite as fearsome as I dreaded, but they are dangerous enough. The ultra-safe thing is to avoid them and their neighbours like the plague until you are strong enough to deal with them, and to avoid moving anything but scouts to a planet unless you have already scouted all its neighbour planets, to ensure that none of them are Dire Guardian Lairs. This does down slow scouting, but better safe than sorry. Since I wanted to take out the two Data Centres as they weren't adjacent to Dire Guardians and since opposition was fairly weak, I neutered all the planets on the way to the Data Centres including the ARS and Factory IV planets. I didn't want those two now, giving me planets on alert in cluster 2 as well as AIP before I'd started to secure my backyard in cluster 1, but neutering them now when I was going for the Data Centres anyhow might save me future pain. All together, this took some two hours or so, much of it at +5 to +6 speed setting, a time that can obviously be improved on with less neutering and more bypassing defenses using transports, but I was in no real hurry. Nevertheless, it was with a certain amount of relif that I turned my eye to the southern cluster, cluster 1, and began scouting it with a view to the main goal of this particular game, conquest! Here the scouting would not be so monotonous! The wave of scouts was followed closely by my fleet, neutering the unworthy and destroying their jump gates in the process, and conquering the worthy! Initial scouting reports showed some major goodies in the western parts of the cluster, so that was the vector of my initial attack. A Zenith Power Generator, Zenith Siege Engine V, Spider Turret V, and Advanced Starship Factory, all close together and very heavily defended. There were none of Raid Engines or Dire Guardian Lairs I feared, but multiple radar dampened Sniper Guard posts doing upwards of a million damage per shot at arbitrary range do incur a certain amount of respect, especially when located under force fields. Let's just say that my Starship heavy fleet backed up by Sentinel Frigates had no problems defeating any of the defenses, but it sure got bloody at times and for the mark 4 worlds I had to peel them one layer of defenses at a time, withdrawing the fleet to repair and receive major reinforcements on a regular basis. Apart from a few heavily defended mk. 4 worlds, most defenses in my 7/7 game had been a joke when my fleet showed up, the fleet being able to destroy all planet defenses in one go; With difficulty 9/9, that was no longer the case. Fortunately, the planets guarded by the Special Forces captain mostly had Special Forces Guard posts all over the place, which were rather easier to deal with. By the time two or three CPAs had come and gone, the western part of cluster 1 was secured and it was time to move in on the eastern part, which had fewer goodies, but one of them was very good indeed: the Superterminal! P9: Dire Guardian Lair or Raid Engine – avoid! 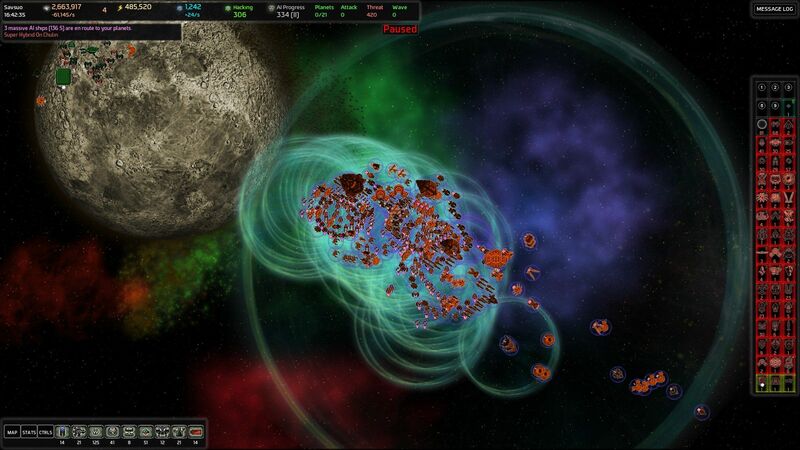 P7: AI defenses intact, warp gate destroyed if adjacent to one of my planets. P6: Neutered planet, that I for some reason or another want to remember something about, so that I don't take action here without remembering it or reading an attached note. P5: Neutered planet with something worth conquering or hacking. P1: Planet that is important to defend. P0: Planet that is essential to defend due to an irreplaceable building. All planets that aren't controlled by me but are scouted and don't have a priority mark are planets under AI control that have been neutered, and in case of those adjacent to any of my planets, have had their warp gate destroyed as well. I had a quandary on my hands: Should I take down the Superterminal now or wait until later on for a greater AIP reduction when I had a larger fleet and Fallen Spire ships some time during phase 2 or 3? I decided to stay with the spirit of the challenge and play this like a game of conquest rather than minimum AIP: I would complete phase 1, and then, when I had conquered the Flak Turret V controller, the Bomber V fabricator, and gotten the Refugee outpost built and was ready for phase 2, I'd take down the terminal as my last act before turning my attention north to the real war. You go to all this trouble to present players with useful information at their fingertips, something I deeply appreciate as I am very much a lover of numbers, and then you don't enable rudimentary sorting of the data. It is a low hanging fruit where improving the interface is concerned. Thus I went about conquering the Flak Turret V controller and the Bomber V fabricator and began the Spire campaign story. AI waves were manageable, but between rebuilding, a hybrid invasion, a CPA, and some of the neutered planets in the south stacking enough ships to launch invasions of their conquered neighbours, it was to be three hours before I had the refugee colony established, four spire frigates launched, and was ready to take on the Superterminal. For that purpose, my navy was heavily augmented with the addition of 36 shield bearers, that my leech starships had nicked from the enemy, and I brought an engineering team along. As soon as the military station III had finished on the planet, Spider V and Flak 5 turrets were installed, as well as every single HBC I had available at the time, that is, all of marks I through III. 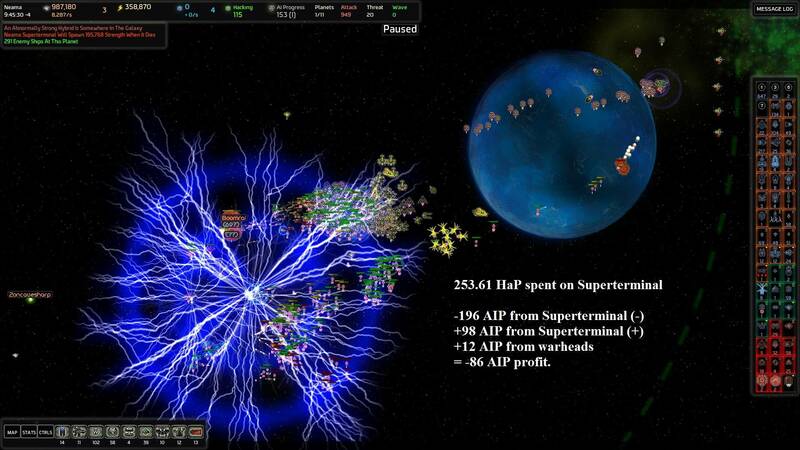 I also had, near the Superterminal that spawns from it would be within the AOE but far enough away that the warheads wouldn't be taken out by accidental AOE from battle near the terminal, four Lightning III warheads under Cloaker starship protection, and further warheads stationed at critical P0 planets along the route from the terminal to the homeworld. The reason for not stationing all the warheads at the Superterminal was simple – if I grossly miscalculated what was needed to ensure that the fixed defenses and fleet killed off the remnants of the superpulsing at the end, rebuilding all turrets for the defense of the next planet and rushing in reinforcements for the ships dead in the Superterminal world, and perhaps doing this for several non-critical worlds in a row before burning AIP to defeat the remnants once an important world was reached, seemed to me to have the least chance of going completely wrong in case of miscalculation. In the event, I happily slaughtered the Superhacking response until the strength increase per tick reached around 6k or so. Based on Lightning Warhead experiences in game #7, I knew that in most cases I could count on a Lightning III taking out roughly 20-40k strength, and probably more like 30-35k if one counted stacking multiple warheads, but I had seen as low as 20-25k, which meant that as strength increase approached 7-8k per tick, and assuming the total level was such that I'd want to use warheads in the first place, further reducing AIP would be an unacceptable risk, as I'd risk paying as much, or more, AIP on warheads than the reduction given, and would at the same time increase the risk to myself if anything went wrong. Thus, at 195,768 terminal strength response and with 334 enemy ships already engaging me, I ordered my Sentinel Frigates to fry the Superterminal, watched the AI spawn thousands of ships, and detonated the four warheads. In a word, it was glorious! Also, I must admit, a bit of a letdown. The warheads destroyed 150k threat, which was in the very high range of what I expected, which meant that it is possible I might have been able to make do with three rather than four. 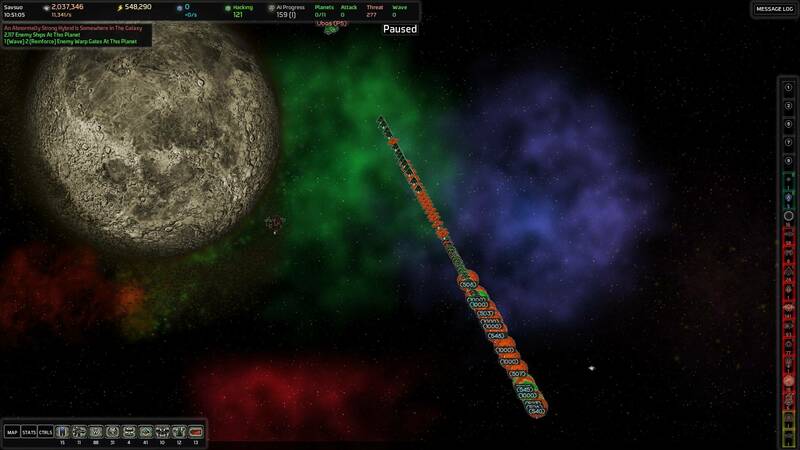 I ended up with a surprisingly large proportion of my fleet surviving the battle, on the order of 60-70%. On the other hand, it is better to be safe than sorry, and it was merely luck – not skill – that made the AI populate its terminal spawn with low-hitpoint ships rather than high-hitpoint ships. In the end I gained a 196 AIP reduction (and hence 98 increase), for a total reduction after counting in the warhead costs of 86, and for a practically risk-free operation (once due precautions had been taken), I'm happy with the outcome. If I'd had a better grasp of the post-hacking Superterminal response in 7.028 I might have hacked for longer, but as I wanted to be damn sure to progress further than I did in game #7, I played it safe in this and other decisions. It was time to take the battle to the hybrids. The Hybrids with a hundred Shield Bearers. Oh, well, it could have been worse. At which point the heroes vaporized the entire solar system and laughed all the way to the bank. They had played JRPGs, and watched horror films, you see. Right, weekend coming up and perhaps a new patch with the turret changes discussed. I guess I'll have to demolish all the Spider V and Flak V turrets to build ordinary turrets instead on the worlds adjacent to still unconquered in cluster 1 (i.e. everywhere, now that I think of it), while building up everything in the homeworld and... well, let's see how it goes from here. EDIT: Patch is here and... Looks like the 2k I spent on unlocking Spider Turrets should now be considered a sunk cost. Spider Mk. I is free if one starts a new game, Spider Mk. II costs 2250 mk. III & IV 3250. Oh, well. These things happen. 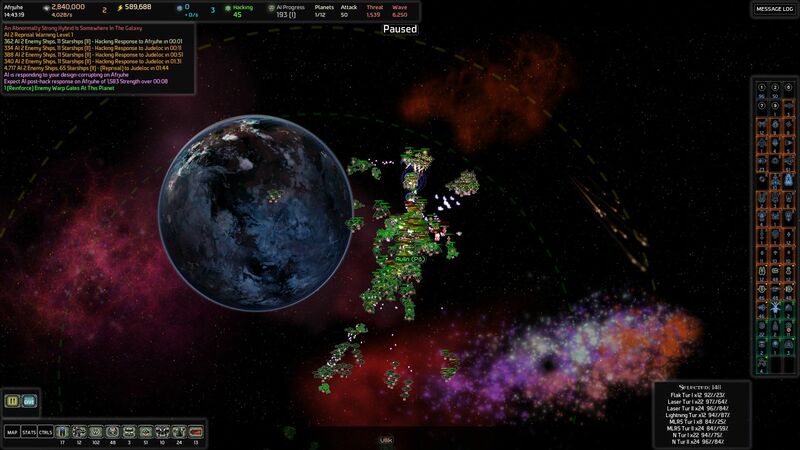 This is what a bunch of happy hybrids look like as they swoop in for the kill as I attempted to break their siege of my homeworld to give me access to the wider galaxy of clusters 2 through 5. I like mark 3 lightning warheads and I like cloaker starships. +3 AIP. My victorious fleet returned for some much needed repairs. Until this point in the game, the Mad Bomber/Reservist had been of considerably greater concern than the Special Forces/Bouncer due to its considerably larger waves, but since no Special Forces tried to move through my homeworld gateway between cluster 1 and 2 during the first 10 hours of the game, I was sure that it must have built up a substantial amount of forces during that time. The big question was this: What is a substantial number of forces at this difficulty level for a SF Captain/Bouncer given the AIP progression I've had over that time? Unfortunately, I had no idea, so I proceeded with caution. Well, if you can call flying for the Advanced Factory IV world to see what would attract them, only to flee when attacked by four or five thousand ships (but who's counting?) and having to burn another mark 3 lightning warhead to prevent fleet annihilation, that is. Could that truly be all of them? For my next foray, I decided to be rather more cautious; The special forces had reacted to my presence on an AF, perhaps they'd react to my presence on an ARS as well? I had an ARS only two hops from my hopeworld, in Ubas. Things looked rather well, I must say. A thousand ships hanging out next to Ubas, probably more hanging out somewhere else, so I sent my fleet through the cluster 2 chokepoint Nefogin to Ubas and hugged the wormhole, allowing me a swift retreat if necessary. The trap worked perfectly. As soon as I arrived in Ubas, the Savsuo forces began to pour in, and my Sentinel Frigates began laying down the law: Humanity was back with a vengeance! So, it turned out, was the AI. 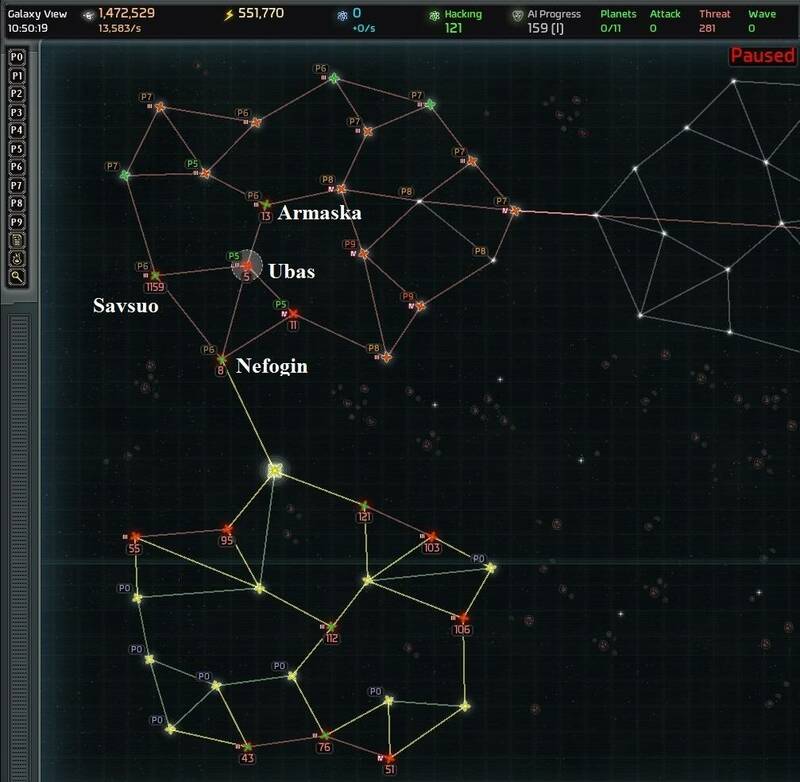 When after losing hundreds of ships the number of enemy ships present in Ubas reached two thousand, twice the number of ships I had originally espied nearby, I decided that I'd better check the galaxy map to see just how many ships were pouring in from Savsuo. Not that I was all that worried, but better safe than sorry and all that. Another thirteen thousand ships, that's how many. And given that kind of numbers, who knows how many following? A strategic retreat seemed appropriate at this point, and the AI chose to not press its advantage (it really is very sporting that way) and began leaving the system via the Armaska wormhole. When the cure arrived, a most delightful spectacle was observed. A few hundred riot starships flying in a triangle with a bunch of carriers hugging for comfort in Armaska. 9 AIP later the problem had been reduced to one that had a known solution – hit and run attacks on Ubas. This, sad though it may seem, became my generic cure-all for the special forces and was repeated on a regular basis. Once they'd built up a fair amount, I'd hit Ubas and within a few minutes the special forces would arrive from wherever they'd been to evict me and get slaughtered in droves. My science vessels informed me that the ARS contained Zenith Reprocessors, Attractor Drones, and Spire Corvettes, but it is doubtful that any of the ships would have provided a greater benefit to me than having a reliable place to bleed the special forces so close to my chokepoint and staging area, where I had a safe escape route and could return to deal with severe waves in a manner of seconds. Following the defeat of the special forces, I set about clearing cluster 2 of threats to my general mobility, also known as, "those two darn Dire Guardian Lairs". This revealed a Data Center on one of the two planets of cluster 2 I hadn't scouted, that immediately to the east of the lairs, and following the destruction of the lairs, its destruction was swift to follow. I also destroyed a few tachyon sentinels in nearby systems to get much better scouting and of Cluster 2 with a view to getting advance warning of incoming special forces, and decided to unlock tier 2 of the scout drones when next the opportunity presented itself, to significantly increase the scope of my up-to-date sensor net. The following is painful to relate, but as more is learned from defeat than victory, I'll relate it nevertheless. According to the plan, I should now hack appropriate targets in cluster 2, perhaps snapping up a few systems in cluster 1 for knowledge if necessary, and then build a spire hub in Spire Hub Alpha aka. Nefogin. It goes without saying that I attempted to do that. Unfortunately, as sometimes happens when plans are laid based on incomplete knowledge, they fail, and sometimes spectacularly so. This is what happened. To test the waters, first I started hacking the Advanced Factory using just my fleet and a hacker, because getting Sentinel Frigates up to mark 4 would be swell, and it was the single most important hack available to me. I had 131 HAP and the AI response level was high (253) due to the Superterminal Hack, but I didn't really have a feel for how vicious the AI's response would be. The answer was: Very vicious! Given the sizable response forces the AI threw at me, I swiftly aborted that hack by scuttling the hacking machine in favour of a rethink. 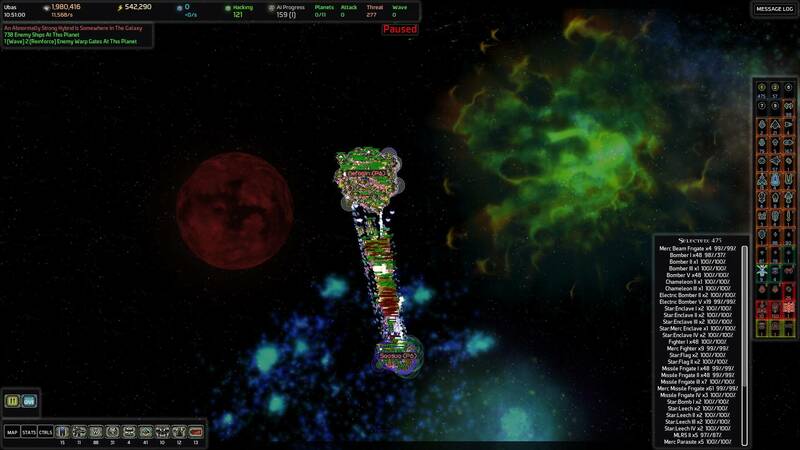 It was obvious that for the hack to succeed, I would need more than the fleet: I'd need fixed defenses in support as well. Which meant conquering a neighbouring planet, to ensure supply, and defending both that planet and the hacking-planet for the 15 minute duration, all while not losing the homeworld. Well, I had a plan that would work with that. While I'd definitely have preferred getting Sentinel Frigate IV before building the Spire Hub, it wasn't strictly necessary. So if I unlocked more forts, which would of course increase AIP, and constructed that first Spire Hub in Spire Hub Alha (nee Nefogin), then beat off the exowave, which should be no problem with armoured warheads, then, boosted by the fleet from the Spire Hub, I should be able to construct forts up in cluster 2 to do the job! Well, it was worth a try, at any rate. So I cleaned out some more systems in cluster 1 to unlock mark 2 and 3 forts, and then built a military 3 station and the Spire Hub in Hub Alpha, and cunningly placed it almost directly on the wormhole, such that anything penetrating to do my homeworld would have to go through the shields of its component buildings first. I was not planning on stopping everything cold at Hub Alpha, oh no. If I tried that and failed just a single time, then whatever slipped through would have my homeworld at its mercy. It would be better to have rather tough defenses in Hub Alpha and then weaker but still impressive defense at the homeworld, just in case. As I did not have a good grasp of how strong the Spire Hub defenses were, however, for the first exowave, which I knew would come when I started building the Spire Hub, the majority of the defenses would remain on the homeworld and afterwards I'd start moving defenses to the Spire Hub when it seemed safe. The Hub would start out with two mark 3 forts as well as my navy, a full set of core spider and flak turrets, and all the beam cannon turrets (which could be quickly rebuilt at the homeworld if necessary), so it wasn't exactly defenseless. Boy, did I feel smart. This feeling lasted for several minutes. Right until the exowave taught me that the amount of force necessary to smash the forcefields such that something could pass through to my homeworld was pretty close to the amount of force necessary to destroy the entire Spire Reactor, that is. With the expenditure of 5 AIP on warheads I stopped the incoming exowave, complete with three Golems, and I stopped it hard, but I was now in the position of rebuilding expensive spire buildings on an unimpressive budget and with a depleted fleet only little aided by the 12% salvage in Hub Alpha. All the salvage my homeworld generated was from a few ships that penetrated once the Spire shields went down. Okay, that was bad, and what was worse, I'd looked as if I'd have to look forwards to rebuilding Spire Hub reactors and their weapons systems whenever anything was strong enough to punch through, which greatly diminished the attraction of letting the enemy suffer from layered defenses. Still, the situation might be salvaged. The weapon stats on the Spire Hub facilitities were good (I had railcannon and heavy beams), though obviously not enough to stop a serious assault on their own, but they scaled by number of modules, and the message I got during the battle said something about building a larger city than the reactor/shipyard/habitation I had built. It thus came to pass that I was greatly unamused to learn the one slight detail that, to the connoisseur of AI War, must have appeared a gaping hole in my original plan: that a Spire Hub can only grow larger than the original three modules when the AI doesn't control any adjacent planets, making it impossible to grow to full size while tanking normal enemy waves. In other words, I now had a steady stream of ever larger exowaves, though thankfully not as large as the initial exowave (though give it time...? ), and normal waves from the 334 AIP as well to tank on an only moderately defended Spire Hub and I only gained 12% salvage. I'd only be able to build the Spire Hub to full if I found some other planet in Cluster 2 to tank normal waves on, which would require me to divert defenses there, which were needed at Hub Alpha/Homeworld when the exowaves arrived. Oh, yes, and the Spire Hub was scanning for another shard to build another city to increase the pressure on me. Fat chance. And what did I have to show for this great weakening of my strategic situation? 600 metal income, 4 additional Spire Frigates, and one Spire Destroyer. Desperation forced my hand. In order for this to work at all, I'd need to get those darn hacks done. The additional firepower should open up new possibilities. Perhaps. A long shot, but there you have it. In the meantime, I'd better move up some defenses to Spire Hub Alpha. And reconstitute the fleet. Oh, and weed out in the Special Forces. I could have blasted them to kingdom come with warheads, of course, but by then the writing was on the wall. Too many mistakes made, too little chance of a recovery. Now, according to my original schedule, this is where I should call it a day and return to AI War a few months down the line. But it happened to be the case that what I am writing now happened last weekend, and that it was known then that a new patch was on the way that would radically change how turrets worked, by swapping the per-planet and per-galaxy restrictions of core turrets and knowledge-turrets, as part of a process of moving (slowly) from the game's chokepoint defense focus (as of time of playing) to a focus on allowing distributed defenses and defense in depth, so long as the energy economy could afford it. And I have always loved defense in depth. I use chokepoint defense when that's what a game rewards, but defense in depth is the defensive style I adore above all others. I thus decided to await the coming of the turret patch Thursday, May 29th, and, once that arrived, rewind time by loading a save I made immediately following the defeat of the special forces, a bit after the 11 hour mark. Then let the AI beware! For I have a cunning plan! And I did play on. To be continued. Incidentally, I wish that the planet view listing "x enemy ships at this planet" tallied ships in carries correcly, just like the galaxy-map does. Likewise, it would be useful if the STATS page reporting number of player and ships actually reported the number of ships rather than something vaguely related. Ah yes, a Hybrid's main aspiration in life: "To Die In Nuclear Flame"
The answer was big too. With a SF captain around the idea is kind of "hit them where they aren't", as pretty much no offensives go according to plan when the A-Team theme starts playing and 10,000+ ships transit in. Clever feints to draw them out of position. Forked offensives. Fast transports full of humanity's avengers. Or you could, y'know, just nuke them all. Repeatedly. Haha, yea, wow. I've heard some feedback on the overall state of hacking responses since the recent changes, but not a ton of it. Some think it's ok, some think it needs to not scale completely by spent_HaP (but instead be partly like the old way, which was pretty gentle as long as your balance was positive). Sounds like it might need some degree of toning down, so that you don't reach a point where even a positive HaP balance (from a reasonable AIP level) can't be spent because the response will just be too nasty. Hmm, perhaps spire city hubs should increase the salvage rate at the planet. So you had the hub basically on top of the incoming wormhole? 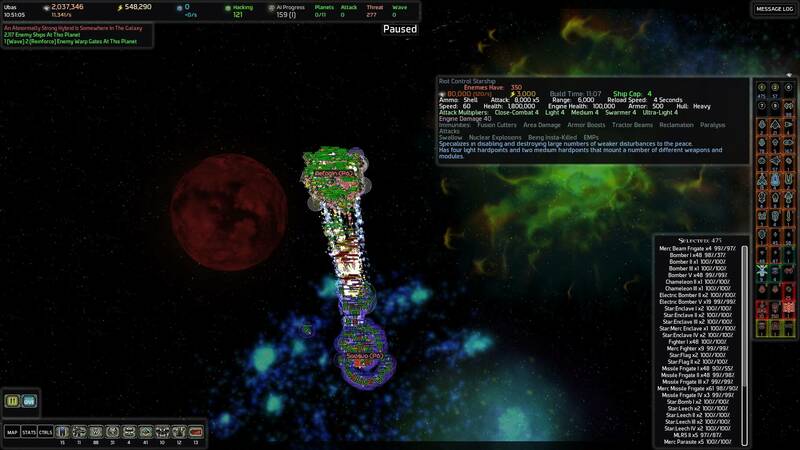 That does help bring the city's full power to bear, but I've often found it can perform a defensive role better by camping the outgoing wormhole, so that all the AI ships don't start in range of the city's shields. Of course, that assumes that there's only one wormhole you want to prevent entry to, which isn't always the case. You'd been counting on that? 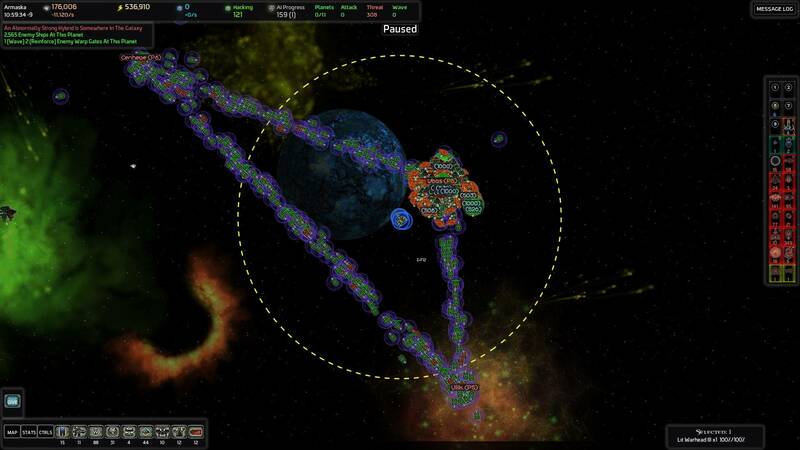 Yea, in FS you sometimes glass whole groups of planets just to clear the lawn or because you want more K or whatever. Without spoiling the next update too much, because as I noted, the playing from this update is actually a week old, I have played on using my alternative strategy based on these experiences using the "peaceful interlude" patch and done considerably better. Based on those experiences, which I hope to have up within a day or two, I definitely agree with those who want it to be toned down. It is thoroughly ridiculous to be told something like "the post-hack response strength is now 1200" (or whatever the formulation was), while hundreds of ships are spawning every few seconds. 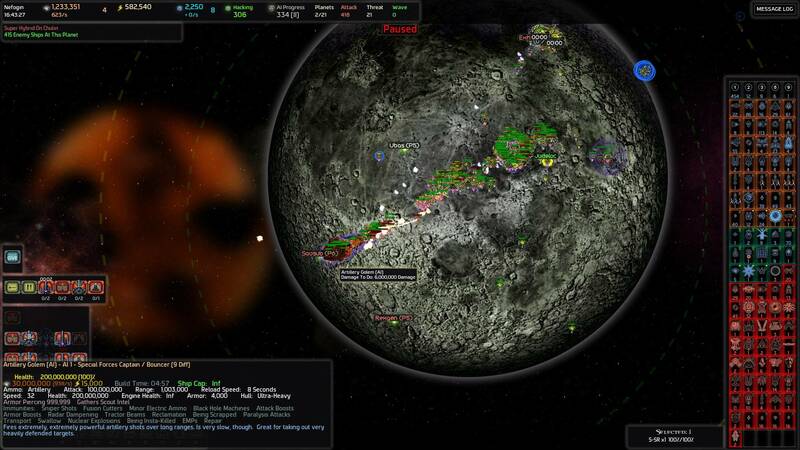 It feels thoroughly ridiculous to have hundreds of HaP, lots of tempting targets, and knowing that attempting to hack any of them will result in a failed hack or swift doom unless I set up something with fixed defenses that's even stronger defensively than my current primary chokepoint planet and have my fleet there to help defending as well, because I've hacked for 373. Let's just say that with the current functionality, hacking the Superterminal in a Fallen Spire game is a huge mistake. I'll see if I can scrounge up an earlier save or construct a situation to illustrate the problem for you, should you be interested, for it feels thoroughly ridiculous. I've performed exactly 3 hacks (superterminal 253, factory 100, design corruption 20), and it looks like I won't be hacking any more in this game (or at least not without slamming full turrets + fleet + full fort 3s + immediately after defeating waves + anything else I can think of to help out). The exowaves aren't anything near as scary as hacking is. No, I had them camping the outgoing wormhole that led to my homeworld. My plan was that the Spire Hub was my first line of defense that with its fixed defenses and fleet support for exos should attrition and kill anything weak, while anybody tough enough to batter down the shields would then proceed to my homeworld, and get slaughtered as it faced another layer of fixed defenses (and possibly quickly built HBCs moving that defense layer from the Hub and inwards in a matter of seconds). Good enough so far as it goes, if it weren't that I'd counted on the shields going down first and then the reactor and other modules pretty much surviving while the enemy progressed to the homeworld, and this wasn't what happened in practice. By camping the wormhole I ensured that when the shields were down and the enemy continued on, the spire modules were pretty much all destroyed, requiring expensive rebuilding. From that experience I learned that I should only camp the outgoing wormhole if I intended the planet with the spire hub as the final destination for the AI in a defensive setup. My second attempt, reloading from the special forces defeat, is now at 27.31.50 with two cities and growing. You gave me distributed defenses and the possibility of playing a strong game of defense in depth. What more could one reasonably desire? Let's just say I don't need spire city buffs for them to work, though they do seem rather puny compared to my other defenses. It is one thing for the spire frigates/destroyers/cruisers to be glass cannons compared to starships - that feels quite appropriate to not completely trivialize things - but those cities really don't impress or help much in fending off even normal waves. Okay, I constructed a hacking example for you, Keith, going from the latest "clear special forces/take screenshots" save and moving a few defenses to a hackable location. 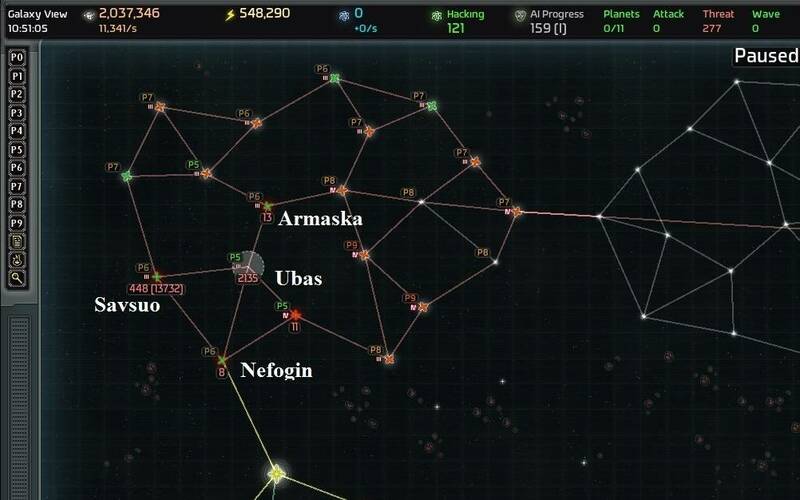 In this save you can start an ARS hack at Ubas under cover of three mark 3 forcefields and guarded by mark 3 of all galaxy-wide turrets, except for spiders, that only have mark 1. There's also the HBCIV and the entire fleet to help defend the hack. Let me make it clear that this is not a serious attempt - if I'm going to make another hacking attempt in this game under the current rules, I'm definitely going to have forts in support before trying. Hacking response level = HaP_spent = 373.61 (very high), and HaP_balance = 354.61. Your mission, should you choose to accept it, is to load up the save, start an ARS redirection hack under the three mark 3 forcefields guarded by scout I and II starships, defend the hack against all the cheesy threats (eye bots etc.) and less cheesy threats (sheer numbers) and see what happens. It is only 10 minutes. It is at this point quite some time since I last attempted a hack, and I've unlocked more turrets since them as well as gaining more AIP, so I have no idea whether it is enough. It might be. Whose death depends on how many warheads are available. Anyway, I agree that a positive HaP balance should permit continued hacking, even with 300+ already spent, even on Diff 9. And I agree based on your description of the situation that it's not really "permitting" any such thing. And this is because it's scaling with previously spent HaP. On the other hand, I also want each hack's pain to be greater than the previous. This was not the case when the response ignored previous spent HaP. It honestly got pretty boring. 1) Make it scale by HaP/5. - it won't be so vicious at 300+. - it will be so vicious at 1500+, despite whatever positive balance one might have, though possibly this is a sufficiently edge case as to not be a problem. - it may make the lower-HaP hacks too easy. Bearing in mind that some games may not see 300 spent ever. 3) Make HaP earned itself actually scale sub-linearly with AIP, so that you gain it at a 1:1 ratio for the first 100 AIP, a 2:1 ratio for the second 100 AIP, etc. So that you wouldn't really be in a situation where you'd already spent 350 HaP and had another 350 to spend unless you'd reached an improbable AIP number. Possibly combining this with some degree of sub-linearizing the response's scaling with spent HaP. How about something like this, a variation of the exponential idea. Choose level X under which everything is supposed to be easily attainable, probably in the easy to moderate current range. Select a suitable a>1. (In other words, keep it much closer to 1 than to 2, or things will quickly get out of hand). The result is flat the first X, then ever increasing but always possible (theoretically) to reduce back to X so long as you conquer enough, up to the point when you run out of galaxy to conquer, that is. So, how about later on in Fallen Spire? Is it at all realistic to end up at 1500+ HaP_spent except with the mother of all Superterminal hacks and attempting to download every design? This method has the advantage that while the AI reponse does not scale linearly with HaP_spent and he may not really have any idea of how it scales after X, the player knows (sees, is told in tooltip) that reducing the response does scale linearly in his hap_total; every extra point of balance reduces the level by one compared to what it currently is, down to the minimum of X, so if he doesn't dare that 300 response hack but would be okay with a 200 hack, he knows that all he has to do is conquer another five planets.... and tempting players to overreach is surely all for the good. Yea, I think something like that could work pretty well. We'd need to make sure it didn't result in any boring hacks (outside the first one or so), but allowing balance to mitigate spent in some way does seem helpful to the overall feel. Case study: X=100, a = 1.1, c = 20: after 10 successful hacks, you can only reduce it down to 300. --- Oh, well, just a stray thought. I'm not at all wedded to this model, and it runs the risk of making hacks too boring in a normal high-difficulty minimum-AIP game, it is just the one that immediately came to my mind when you outlined the parameters of the problem. I reloaded the game from the special forces defeat, updated to 7.032, and hashed out my new and improved plan. I regret to say that it was somewhat against the original spirit of the challenge, which would have me conquering all over the place as soon as possible, and more in line with a normal AI war game in keeping careful control of AIP for the longest time. Throughout phase 2, remember to clear out special forces by visits to the Ubas ARS planet every now and then. Destroy the Dire Guardian Lairs and Data Centre in cluster 2 (again). Capture interior provinces in cluster 1 sufficient to unlock level 2 of all basic turrets. 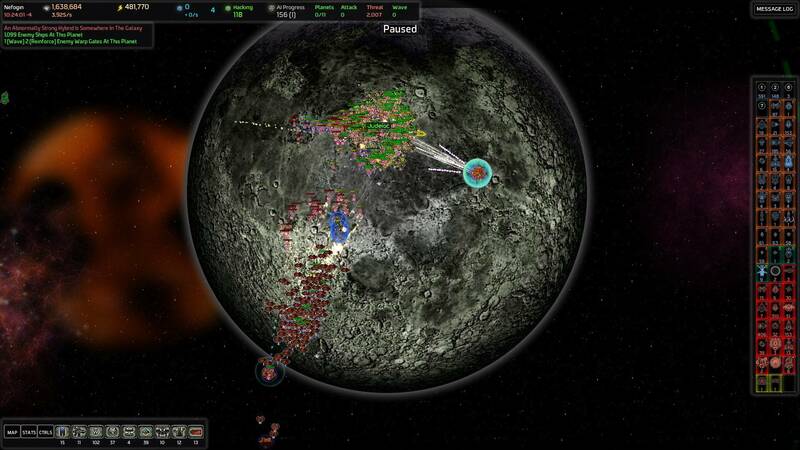 Capture the top-left most planet in cluster 2, which borders both the Advanced Factory and Bombard Design Backup planets, and neuter its three neighbours. Take advantage of the new turret rules to set up full sets of turrets at the newly conquered planet and at the hack planets. Hack the Advanced Factory and Design Backup, bringing hacking AI response to 373, try Advanced First (highest priority) and see how it goes. Begin large scale scouting, scout most or all of the galaxy, going on excursions to neuter planets or kill Tachyon sentinels to pave the road for the scouts. If the hacks weren't all that hard anyhow, hack more targets of opportunity in clusters 3-5. Given how wimpy the Spire Hub was in defenses in the last attempt and how my planned "shift to tank directly on the first Spire Hub" was an abject failure, with me getting a poor defensive position with negligible metal income and a tiny beginner Spire Fleet, I am not going to repeat those mistakes. I'll make brand new mistakes instead. It seemed as if some of the exos arriving in the last attempt were going for the homeworld and some for the spire hub, and that means exploitable opportunities for anybody who likes defense in depth. Throughout phase 3, remember to clear out special forces by visits to the Ubas ARS planet every now and then. Unlock mark 2 and 3 of economic stations. 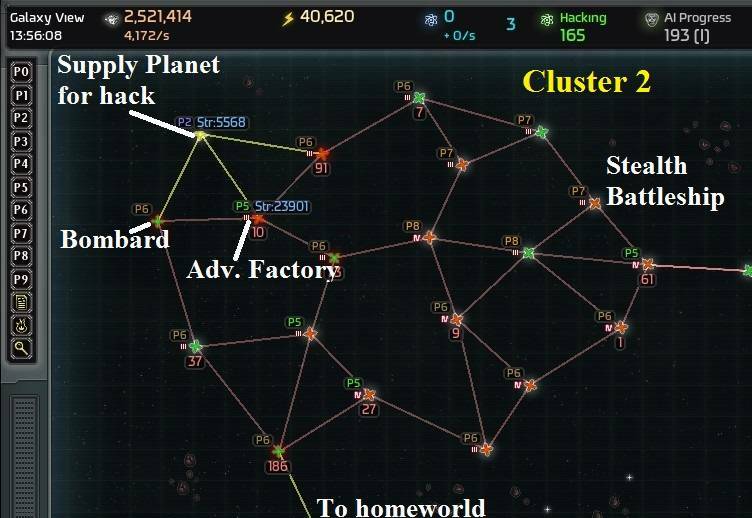 Make all planets in Cluster 1 not adjacent to the homeworld into economic stations, with the higher tiers furthest from the homeworld's chokepoint entry to the cluster. Strip these of all defenses. The marks 2s and 3s provide a total of 7*(160+320) = 3360 baseline metal income and 7*(75k+150k) = 1,575k energy. I'm going to need that energy. Unlock fort 1 and as many turrets of level 3 as can be afforded. Put all the mark 1 forts, a full set of all normal turrets available, and all the core spider and flak turrets on the homeworld. Put Mil3 stations on the three interior planets next to the homeworld and give them full turrets and basic forcefields, just in case anything should try to break through. Place the stations and their turrets such that they cover the transit routes from the homeworld wormhole to any of the other wormholes in the system. Build forcefields on the outgoing wormhole on the homeworld leading to Spire Hub Gamma, so anything trying to penerate to pass through the cordon of death listed above will have to batter down those forcefields first while under fire from the homeworld defenses. Wait to have full metal immediately after waves. Build the first spire hub in an interior location on Spire Hub Gamma. Defeat the first big exowave, taking it directly on the homeworld, with the entire fleet camping on the homeworld between the exit-wormhole guarded by forcefields and the entry-wormhole from cluster 2. Build Spire Hub Gamma up to level 2 immediately, with one habitation centre, 3 shard reactors, and two shipyards. Conquer the entry chokepoint in cluster 2 and build Spire Hub Alpha, defeat expected exowave. Set up 3 shard reactors in Spire Hub Alpha, and replace two reactors in Spire Hub Gamma with Shipyards, such that Spire Hub Gamma now has one habitation centre, one shard reactor, and four shipyards. Build the 20 Spire Frigates, 4 Spire Destroyers, and 2 Spire Cruisers now possible. 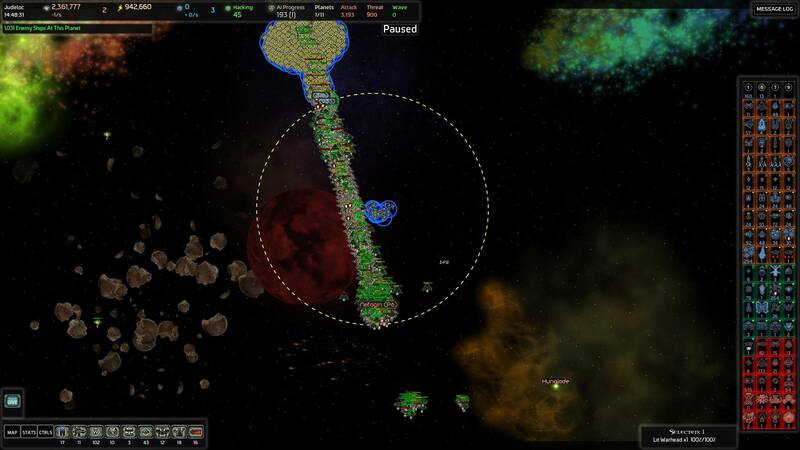 With Spire Hub Alpha under my control, it means that Ubas is now in supply, so build up a full set of turret defenses there to aid my fleet whenever I decide to prune the special forces. That should allow the killing of thousands per visit rather than 500-800 casualty hit-and-runs. Make new plans once at this point – it'll still only be 12% salvage from tanking waves on Spire Hub alpha, but the baseline metal income will be much larger than in the last attempt due to the economic stations, and the fleet's combat power will be substantially larger. As expected, clearing out the Dire Guardian Lairs and extra Data Centre took a considerably shorter time the second time around, and by 13:56 I had set up the circumstances for the first hack, that of the Advanced Factory. I had a hard time choosing whether to attempt the factory first or the design backup as I didn't have a good feel for how hard the hacking would be at ai response 253. If it was fairly easy, then the correct thing to do would be to perform the design backup hack first and then start the factory hack at 273, which could be expected to be only marginally harder, whereas hacking the factory first and then the backup at 353 would be substantially harder. On the other hand, if it was difficult to hack at 253, then hacking at 273 might potentially be too difficult, and getting the factory hack was a much higher priority than the backup hack. Finally, I had two really good options for design backup hacks – the Mad Bomber's Bombard and the Special Forces Captain's Stealth Battleship. I really, truly, disliked both, but on balance, the 33k range sniping-immune Bombards under the command of an insane AI that threw double-strength waves at me was the most dangerous. As further support for attempting the Bombard, it would have required substantially more AIP to set up a supply-planet next to both the factory and the battleship backup. The factory hack went well. 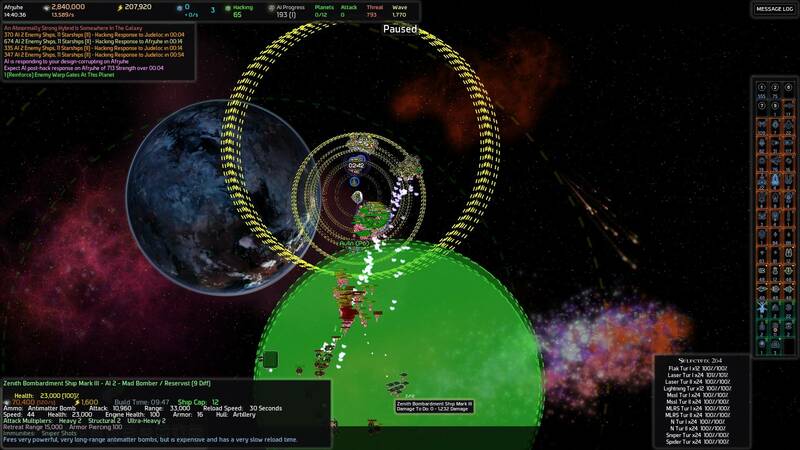 The supply planet, bristling with turrets and with all three incoming warp gates destroyed, did not come under attack, and in the factory system, the turrets supported by the navy was sufficient to defeat the flood of incoming ships without major casualties, so between the hack, building a full set of shiny new mark 4 sentinel frigates, and defeating a CPA and a wave or two, I was ready to attempt the design backup hack (353 ai response) at around 14:38. This would be a short 5 minute hack. What could possibly go wrong? Sure, the number of incoming waves to the hacked planet and the chokepoint homeworld were completely ridiculous compared with the wimpy estimated post-hack strength, but this was child's play. The incoming AI ships were slaughtered by the turrets and sentinel frigates, and anything that survived that was ruthless destroyed by the main blob of ships, which included a substantial number of mercenary missile and zenith beam frigates in addition to its baseline strength. At 2m 18s into the hack, that is. Two minutes later, with 46s remaining on the clock, serenity was the last thing on my mind. The hacking response waves were coming hard and fast and my navy had suffered serious casualties. Careless placement of the neinzul starships had cost me four of them (fortunately the lowest marks, but still) and my riot starships were all gone, but all categories were under fire. This was going to be a close call. It succeeded, barely. Down to a handful of starships and a scattering of fleetships, with the turret defenses under attack, the design hack succeeded and the threat of zenith bombardment ships was gone, at least from the Mad Bomber. None escaped the conflagration as the massed AI ships killed off the remaining defenders and defenses, before joining the roving bands of AI threat and beelining for my homeworld in support of the many hacking response waves and the 4.7k reprisal waves caused by the loss of my fleet. The wave that I had no fleet to stop, at a chokepoint that was already heavily under assault by the many, many, smaller hacking reponse waves that had already hit it, rolling up the minefields and starting on the forcefields protecting the flak and lightning turrets. Fortunately, I had a solution for that. A mark 1 and mark 3 lightning warhead evened the odds to the degree that the fixed defenses and the rapidly rebuilding fleet stopped them quite handily. Hacking at 350+ was just too darn dangerous. Yes, I won this time, but not only did I nearly fail the hack, if I'd been unfortunate with the regular wave timing and they'd coincided with the reprisal wave, my survival would have been in doubt. That it went as well as it did in this case was to a large degree because my effective AIP was so much lower than the total AIP I'd accumulated and henced what I'd had available to invest in defenses. In other words, conquering more from here (which was a requirement for hacking anything with supply-planet and turret backup for the fleet in the first place), even though that would unlock even more defenses, was likely to make the hacking situation even more dangerous without a corresponding increase in defensiveness, and it was already too darn dangerous to really justify. Under the current hacking rules, it had been a mistake for me to take down the superterminal. Yes, I got a net -86 AIP, but the 253 points could have been spent much more profitably on hacking fabricators or design backups for long term gain, where those -86 AIP only corresponded to four planets and change. When I hacked it I was under the assumption that I'd be able to keep on hacking throughout the game as I accumulated HaP, but effectively the way the ai reponse worked there was something approximating a hard stop in the 300-400 spent range, beyond which the rewards of success just didn't justify the risks. In other words, unless things change in an upcoming beta, no more hacking for me. But enough misery! I had all four marks of sentinel frigates, the Mad Bomber was left with only the bombards it had already produced, and it was time to scout the rest of the galaxy to find the Data Centres and Co-Processors! I had found one Co-Processor in cluster 1 and three Data Centres in cluster 2, so there was a lot left to be found in the other three clusters, surely!